This Slow Cooker Pork Tenderloin is covered in an easy garlic herb rub and drizzled with a honey balsamic glaze! 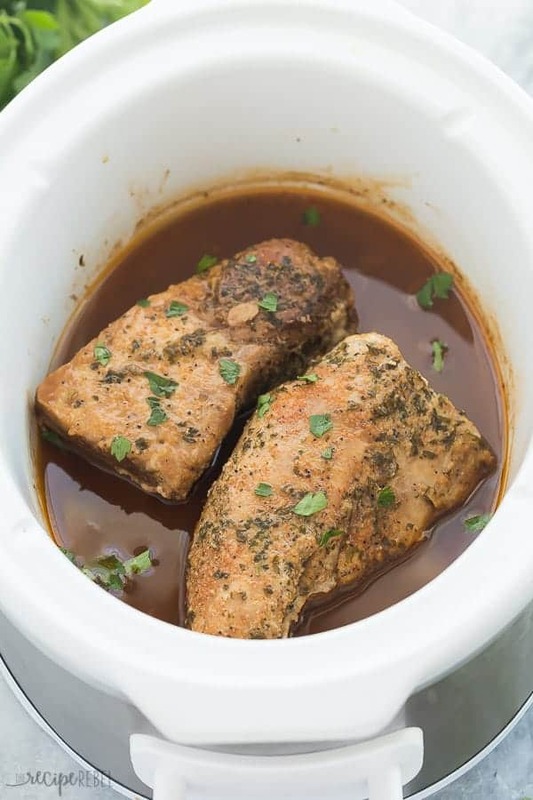 This crock pot pork tenderloin is made with minimal effort and maximum flavour. It is moist, tender and perfect over pasta, rice, or mashed potatoes! So when I busted out my crock pot this morning to make this Slow Cooker Pork Tenderloin, I almost felt a little guilty. Because of my recent commitment to all things Instant Pot, I’ve neglected my slow cooker and slow cooker recipes a lot lately (if you’re looking for more easy slow cooker recipes, check out these Dump ‘n’ Go Slow Cooker Recipes!). They haven’t made much of an appearance at all (in fact, I don’t even know when the last time I pulled out my crock pot was!). We use our slow cooker for dinner often on Sundays while we’re away at church, and it has been awesome coming home to a fresh meal (no quick bowls of cereal or back-of-the-fridge leftovers for us!). This slow cooker pork tenderloin would be perfect for that, as it doesn’t need to cook all day! I wanted to keep the recipe simple, but I also like to add a ton of flavour to my pork. I’ve done this with a garlic herb rub and a honey balsamic glaze — honey balsamic anything (grilled chicken, pulled pork, beef stew….) is pretty much my favourite thing lately, and it’s perfect for those sauce-lovers in your life. Alfredo sauce, barbecue sauce, ketchup (I know, I know — roll your eyes! ), teriyaki sauce — just pour it all over! If you’re not into it like we are, feel free to leave it off. 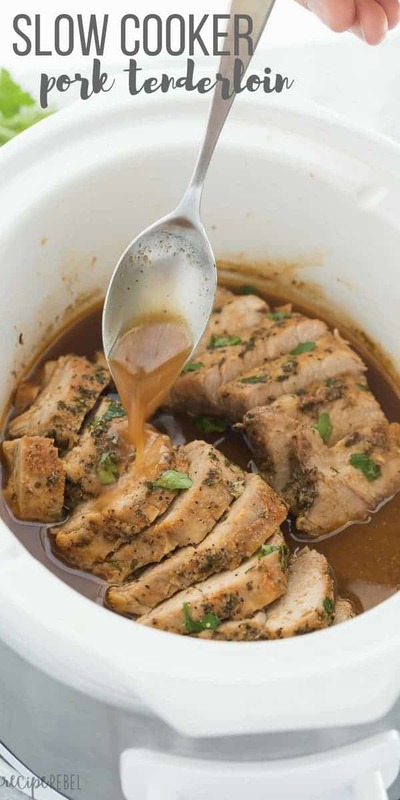 You can add a 1/4 or 1/2 cup of broth in the bottom of the slow cooker for moisture, and then just remove the pork tenderloin from the crock pot and slice and serve without — it is just as good! One of the most important things is not to overcook your tenderloin! It is so moist and tender when cooked perfectly, and we don’t want it to turn dry and unappetizing. The best way to know is to use a meat thermometer to check the internal temperature — it should be about 160 degrees F and you need to let it rest 5 minutes before slicing. If you’re not a fan of balsamic vinegar, try cooking without the sauce (add a little broth to the slow cooker for moisture) and brushing with barbecue sauce before finishing. We love it this way, too! How long does it take to cook crock pot pork tenderloin? Most pork tenderloins are roughly the same diameter, so the cook time for this recipe will mostly vary depending on your slow cooker or crockpot. It’s important to know your slow cooker and how well it heats — do you usually end up having overcooked meat or undercooked? Do you usually need longer or shorter cook times? How well done do you like your tenderloin? These are all important things to consider and will vary depending on the person. I recommend starting with 1.5 hours, checking the temperature and adjusting from there. If you have a large slow cooker that takes longer to heat up, you may want to start with 2 hours before checking. What is the difference between Pork Loin and Pork Tenderloin? While you can absolutely use this recipe for a pork loin (I love cooking pork loin in my slow cooker or crockpot and usually use that cut for pulled pork), you will need to adjust the cook time because they are not the same thing. A pork loin is much thicker (likely twice as thick in diameter) as a pork tenderloin, so it’s important to know the difference because a pork loin will need at least twice as much time. If you’re making pulled pork, you’ll want to give it lots of time to get to that fall-apart-tender stage where you can shred it easily. If you are cooking a pork loin, and not a pork tenderloin, you might want to check out my Slow Cooker Pork Loin recipe instead. Don’t have a slow cooker? Try my easy Roasted Pork Tenderloin. This Slow Cooker Pork Tenderloin is covered in an easy garlic herb rub and drizzled with a honey balsamic glaze! Everything cooks together in the crock pot with minimal effort and maximum flavour. It is moist, tender and perfect over pasta, rice, or mashed potatoes! If your pork tenderloin is longer than your slow cooker, cut it in half crosswise (so you have two shorter pieces that will fit inside). In a medium bowl, whisk together the broth, honey, balsamic vinegar, ketchup and corn starch and pour into the slow cooker. In a small bowl, combine garlic, parsley, salt, pepper, onion powder and paprika. Rub over all sides of the pork tenderloin and place in the slow cooker (I use a 2.5 quart oval slow cooker). Cover and cook on high for 1.5-2 hours, or low for 4 hours, until a meat thermometer inserted in the thickest part reads 150-160 degrees F.
Move tenderloin from the slow cooker to a cutting board and let rest for 5 minutes before slicing. If desired, add additional corn starch and water to the juices to thicken further. Serve. This recipe looks great! Ingredients are ready to start. I’m going to be making potatoes with it- probably best not to cook those in the crock pot, right? I also thought about putting in a zucchini and bell pepper – do you think this would clash? I think those would be fine, you just have to be careful with the cook times. You don’t want the veggies too mushy! The potatoes I think would need a longer cook time in the crockpot, but if you cut them into fairly small pieces it might work! Loved the way this turned out! Delicious flavors and so easy to do. That pork loin is spot on! Looks like a great meal to gather the family around the table! Such an easy recipe and the tenderloin came out perfectly! Thanks! This was a huge hit in our house. So easy to make using the slow cooker. Hi Jessica! I just put it on for 8 hours, and then turn it off after 4 hours so it doesn’t overcook. This is one of those recipes that I think is perfect without any tweaks as long as you like the taste of balsamic. I double the recipe and use the leftovers for shredded pork soft tacos the following night. I love the idea of using the leftovers for tacos! I made this last night and it was fantastic! I used the exact measurements of all ingredients and I thought that the mix of flavors was perfect. The only thing I did differently was after putting the spice rub on the meat, I seared the meat in olive oil until all sides were brown and then put it in the crock-pot. I think this give the meat a better flavor. My husband loved this too – will definitely make again – thanks for sharing! I have a 2.11lb pork tenderloin. What do you recommend for cooking length? Thank you! It really depends on what you prefer for doneness. The cook time might be sufficient, but I would probably cook it for 2.5-3 hours on high, or 5-6 hours on low. I made this recipe with 2 lbs of pork tenderloin and therefore doubled the recipe ingredients and it didn’t taste right… the balsamic especially was overbearing. This was honestly one of the best, easiest recipes I’ve made in a long time.i don’t use the slow cooker often, but I hand a pork tenderloin from Trader Joe’s on hand and was curious about doing it this way, so I found your recipe on line. I used herbes de Provence instead of parsley, and minced garlic instead of garlic powder. Otherwise followed the recipe, with the addition of to the crock pot of: baby carrots, 1 medium chopped onion, and fresh mushrooms. I served with ready made mash potatoes. Super yum! Did you add the onion, carrots and mushrooms to the crockpot? If yes did you have to increase the liquids? Came out great!!! My 11 year old was able to put this together for me when I was totally exhausted (8 months pregnant)! It was a little more work than just rubbing the pork and sticking it in the oven, but it was nice to make ahead (and my oven was broken so it was really helpful for us). It came out really tender. I served it with a healthy lentil/rice pouch from Whole Foods (90 seconds in the microwave) and garlic green beans. Healthy dinner made easy. Thanks! I’m so glad you all liked it! Will I dry the meat out if I keep it on warm after cooking on low for 4 hours? I cooked it a bit ahead of schedule and won’t be serving for a few more hours. Any recommendations would be great. How did it do on warm? I have never kept it on low quite that long but I think it would be fine. If you try it I’d love to hear how it goes! I made this, but I replaced the ketchup with blackberry and blueberry preserves. I find the fruit brings in a whole new wonderful layer to the glaze, and highly recommend using some sort of berry or cherry preserves in place of ketchup when making the glaze. Oh I love that idea! I’ll try that next time! Silly question – do you drizzle the sauce over the pork tenderloin while it’s cooking in the crockpot? I cook it with the sauce in the crockpot, and then serve with it as well! This sounds delicious except for one thing – the ketchup. Can you tell me what purpose it serves in the flavor of the sauce? Also, how much time should I add if I’m doing two tenderloins on low? And four tenderloins? And one more thing, will any leftovers stand up to being frozen and reheated? Thanks Jennifer! The ketchup adds a ton of flavor — it’s sweet, tangy, savory. You shouldn’t need to add any time if you’re doing more tenderloins unless the slow cooker gets to be quite full or you have to stack them on top of each other. At that point, you may need to add an hour or two to the cook time. Thank you, Ashley. I’m gonna trust you on the ketchup. And we just got a brand new 8quart oval slow cooker so I think we could do four tenderloins without stacking them. With that said, what about freezing? Do you think they will maintain their tenderness and juicyness if frozen? I have never tried freezing pork tenderloin after cooking, so I can’t say for sure! I would love to hear how it turns out for you! The two pieces are 2.8lb together? You may want to double the seasoning ingredients but you won’t necessarily have to double the sauce, unless you want a good amount! Question: I have what the package says to be ” pork loin tenderloins,” but they are 2.5lbs each in a double pack from costco. I want to use this recipe but based on your comment that pork loin vs pork tenderloins and the size of 1 lb..I’m wondering exactly what cut of meat I bought?!? Do you think they Are the tenderloins or pork loins? Way to confuse me, Costco! I checked out the pork loin recipe but I want to use the basaltic honey one regardless. Ahh..wish me luck! Hi Donna! I would say those are likely pork loins if they are 2.5lbs each. You can definitely still use this recipe but you will want to increase the cook time considerably! I hope that helps! I buy these from Costco and what looks to be a pork loin is actually two tenderloin. They separate once you open the package. EXCELLENT recipe! I had this tonight with my mom and we ate every last bite (with just a smidgen of help from our pups). We had this with Wegman’s mashed potatoes and oven-roasted asparagus (recipe from spoons across america). It all went together wonderfully and I will certainly make again! Can I use beef broth instead? I had everything but that. You could but I find that beef broth has a very strong flavor so I prefer not to. I would likely choose water or even apple juice before beef broth. How could I make this in my instant pot? Can you make this with frozen tenderloin? How long would you cook it for? Thanks Kathleen! I have never made it with frozen pork tenderloin (it’s not really recommended but it’s not impossible 🙂 ) I would probably give it 8 hours for frozen. Wonderful recipe! I made it with a frozen tenderloin, and it only took about three hours. It was slightly pink in the center, but when we reheated the leftovers the next day, it was perfect. Easy and delicious! Thanks Linda! I’m so glad! With tenderloin, slightly pink is actually perfectly cooked by most peoples standards, so there’s nothing wrong with that! Delicious and so easy! My family loved it! I doubled the recipe and cooked it on high in my crock pot for four hours. Thanks for leaving a comment Lynda! I’m so glad you liked it! Just made this, came out great! So easy. Will definitely be using this again. Thanks Kelly! I’m glad to hear that! I want to make that tenderloin but I don’t have balsamic vinegar. Do you think that skipping it can compromise the taste much? I was thinking mabey a hint of mustard will do the trick? What’s your opinion ? I think you could leave it out but it won’t have that same tang that balances out the sweetness — I would probably substitute with a bit of apple cider vinegar if you have some, or even white vinegar. You can also just leave it out, then taste the sauce at the end and add a bit of something if you think it needs it! Definitely! You’ll just want to make sure they cook in about the same amount of time. Potatoes may cook longer. Did I mess this up? Because I cannot understand how this was so good to everyone else but so yucky to me….All day the house has smelled nauseatingly vinegary – like Easter egg dying day. I used good quality aged balsamic. I did double the broth recipe because the roast was 2.25 lbs and I wanted enough to make a gravy when done. The meat itself was tender but vinegar and onion powder was all I tasted. No hint of honey whatsoever. Cooked for 4 hours on low. Maybe it needs longer to reduce the balsamic more? Too bad — I really wanted to like this. I prepped it tonight and will put it on tomorrow… i hope this isn’t the case for me! I tripled the recipe because mine is 2.2 lbs (2 tenderloins)… fingers crossed. Do you not like balsamic vinegar? Was the vinegar old? Hi Sara! I’m sorry you found that. Can I ask what you were cooking? A pork tenderloin is right around 1lb pretty much without exception. Balsamic vinegar will generally smell strongly when cooking but the honey should balance it out when the sauce is finished. I’m sorry you didn’t find that to be the case! I made this tonight and it was unfreakingbelievable! Thanks for a great recipe! I’d love to try this recipe. I would have to at least double it for my family and I have a six quart crock pot. How do you think this would effect the cooking time? I think if you have to stack the tenderloins directly on top of each other, you may find you need a little more time. It will depend on how many you can get to lay flat on the bottom, but I think in a 6 quart that that could be done? I made this with a garlic balsamic vinegar and it was absolutely amazing. Thank you for the recipe. really nice meal!! I improvised a bit with the rub, using garlic salt with parsley and dried onion flakes..added a bit more broth so as to have more sauce–still delicious! The tip about not overcooking was especially helpful. Will definitely make this again. 5 stars. unable to leave rating below! You had me at honey balsamic. Yum! This is a great pork tenderloin recipe! Love all the tips here! I’ve never done a pork tenderloin before but I’m so excited to try with this recipe! I’ve totally been completely ignoring my crockpot since I got my instant pot too. LOL I’m seriously all over how incredibly TENDER this pork looks! That honey balsamic glaze is speaking right to me. The pork is fall-apart tender and the flavors are so delicious! 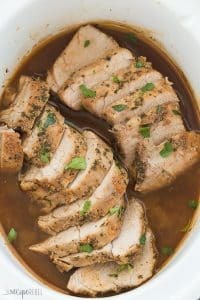 Why I never think to use my slow cooker for pork tenderloin I’ll never know, but this recipe is certainly a keeper and one I will make again and again. I love an easy dinner recipe and this one sure hit the spot, so easy and so much flavor! Sounds yummy. Sad for me I only have a 1.7 frozen port tenderloin. Any idea of how much extra to cook it? Ready to defrost that puppy! You can absolutely use it! I would still cut it in half, and I would probably do the first check around 2.5-3 hours. If it is just longer and not wider, then it might not need any extra time. We also love sauce. All kinds! I haven’t used my slow cooker either since I got my Instant Pot. It’s probably time to break it out and give it some love. This pork sounds delicious! That sauce sounds just amazing.